So, to all those out there wondering, no. I am not going to try to create a stronger sense of urgency on the team. And you shouldn’t either. A sense of urgency isn’t the goal. Trying to create urgency reflects the age-old confusion of hurrying with speed — the misguided notion that if you’re not always hurrying, you’re already behind. If you’re not working on the product every day (and frankly, even if you are), it’s easy to believe progress should be faster. After all, we all want fast. There’s always more to do than we could ever accomplish, and moving faster would get us there. If the team just hurried a little more, we wouldn’t have to make tough choices. As anyone who has ever forgotten their keys in an effort to get out of the house on time knows, hurry often backfires. The panicked, frantic pace values action over results and has consequences. Shortcuts and sloppiness. In theory, professional software engineers, designers and product managers would always turn out professional work — refusing to take shortcuts that would compromise their output. In reality, we all carry a desire to please and our jobs depend on a willingness to adapt to the direction of the company. Even a top-notch team isn’t immune from the pressure, and little things start to pile up — small UX issues we don’t have time to fix, less than thorough test coverage, failure to monitor key processes and tech debt in a new feature. Limited space for creative solutions. Constant pressure to hurry reduces our ability to be proactive. We don’t take the extra twenty minutes to understand design intent and cut out several days of work. We fail to realize a browser extension is altogether the wrong solution and we need to stop investing in it. Stepping back takes time, so it’s often discouraged in pro-urgency environments, but it’s in these minutes or hours that weeks and months are saved. Micromanagement. Trying to create a sense of urgency takes effort. Are people coming early? Are they staying late? Is enough being produced? That’s a lot of work for a leadership team that should be focused on bigger, deeper issues. Furthermore, it undermines trust with the team. Be careful dismissing this point too quickly — even if you would never micromanage, you could be creating the wrong incentives for managers in your group. Loses potency quickly. Artificial urgency for milestones loses its potency quickly — over the course of a job, and over the course of a career. For experienced software engineers and designers (the folks you most need wisdom from), it comes off as amateur and doesn’t inspire long term loyalty. Takes over communication stream. When communicating urgency is the highest priority message, more important messages like why are we taking on this project and who is going to benefit? — the very messages that get great results — are drowned out. Let’s retire sense of urgency and instead look for sense of purpose. A sense of purpose is a deep understanding of the reasons behind our efforts and a desire to pour in time and energy because that purpose resonates with the impact we’d like to make on the world. A sense of purpose is immersion in our cause, and allowing that exposure to motivate action. A sense of purpose is about going faster and smarter toward a mission we all see clearly. It’s about using good judgment because we all understand the short and long term implications of our actions on what we’re creating together. A strong sense of purpose manifests when a software engineer watches a potential customer struggle with a workflow and stays late to make the changes that make it easier. It shows itself when a designer spends their weekend on a few extra iterations because they felt engaged with the problem at hand and want to produce a better solution. Turns out when you stop looking to create urgency, the passion and purpose latent in your team might just cause the right things to get done at just the right pace. 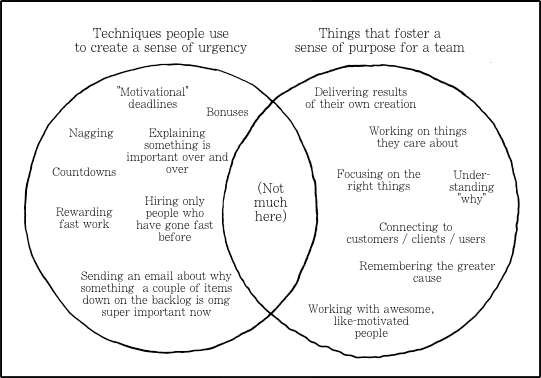 Crafting a sense of purpose is different than creating urgency. A team with a high sense of purpose can look a lot like a team with a high sense of urgency. Output is high. People are engaged. The critical distinction is that what you do as a leader has very little overlap. Creating a sense of urgency is about deadlines, nagging and sheer speed. Fostering a sense of purpose is different. It’s a collaborative endeavor, and it requires trust that your team members will translate their sense of purpose into increased effectiveness. Your primary job as a leader is to hire the right team, and then to spend time inspiring this sense of purpose. Help people understand the impact of their work, and speed will follow. Postscript: There’s a time and a place for everything. All this is not to say we can afford to waste time. Managing (and eventually letting go of) employees that can’t keep up a reasonable pace is a competency every company needs to develop. Most reasonable organizations need predictability and have good reasons to create well-considered deadlines. And every company wants to go fast. The key is to avoid letting sense of urgency become a goal in itself.